This resource features the general description of Gembrite City. Gembrite is settled on top of a cliff by the sea. It includes adventure ideas that are scalable for low to mid-level (Levels 1 to 10) adventuring parties. Challenge Rating (CR) is calculated using a party of four as the model. 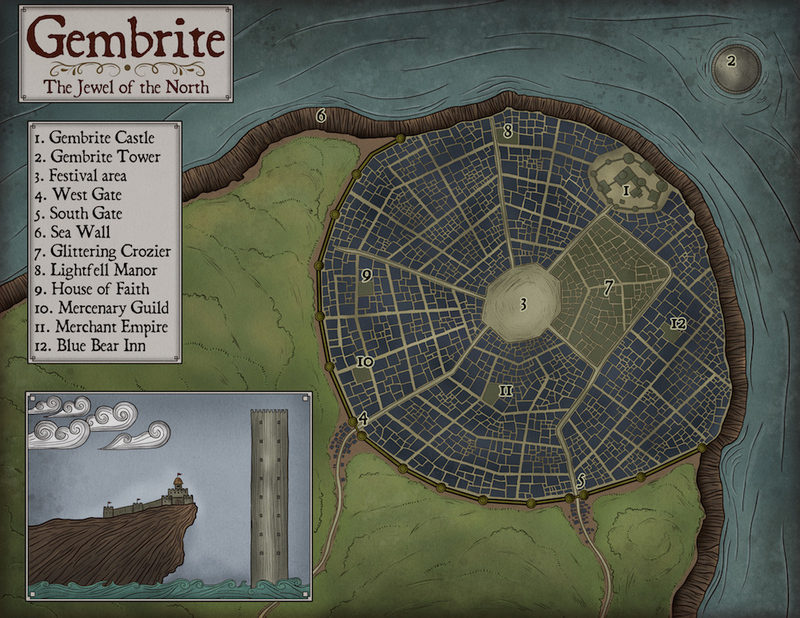 Gembrite is a large northern capital city, situated on a high cliff-side on the coast of the Troubled Sea. The circularly shaped city is enclosed by high walls. The original settlers of Gembrite came here to mine gems and ores in the rich veins under the cliff. Anticipating greed and competition they also built the place to outlast even the most stubborn siege. Larders and basements go deep below the earth, full of grain, seeds and dried meat. Gembrite’s sea produce and fish is an important part of its economy. Fishing can still be done even if the city is under siege; so long as enemies do not surround them from the sea too. Gembrite’s surrounding area is not developed. There are no farms. Instead, scores of towns and small settlements in the region pay tithes to Gembrite. This feudal relationship is beneficial for both parts. Gembrite gets the much-needed resources for a metropolis of its size. And the small settlements get access to trade and protection. Gembrite is ruled by a Lord of the Q’uarend family. The current ruler is Lord Damasco Q’arend, known as the Savage Boar. He earned the title winning the last war almost twelve years ago. Since then he has become lazy and comfortable. The Lord of Gembrite is not the sole authority in town. For a long time, the ten wealthiest or most influential families in Gembrite designate a representative for the Heraldry Council. The ten members of this council are the greediest and most corrupt men in the city. It is common gossip that any plot, murder, sacking, charity or party always occurs under the shadow of a Heraldry council member. Three of the councilmen represent the three families in control of the mines. These are Carlo d’Monteri, Sir Tabbur Andersan, and the elf Aurin Gaddalar. The mines must pay a percentage of their earning to Lord Q’uarend by contractual obligation. Gembrite’s main feature is its defensibility. Unlike other cities that keep growing outside of their walls. 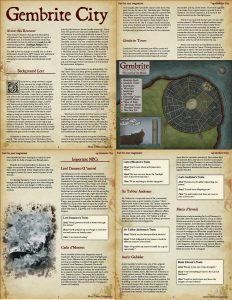 Gembrites refuse to leave the safe space inside the city walls. As a consequence, buildings have started to grow upwards. Most buildings feature two or even three stories. There’s an architectural limit to how many buildings can be grown to those sizes, and they have reached it. The city is out of space. The two main roads outside of Gembrite have seen some affluence. Some poor neighborhoods of merchants are growing outside the city walls. The lack of any military need in the last decade has made people softer and more comfortable. Gembrite fares well and the outside neighborhoods do not pose any trouble. But as soon as a foreign force tries to attack Gembrite once more, those neighborhoods and the people who inhabit them will be the first to fall. Merchants of all kinds sell their wares in Gembrite, from humble butchers to expensive jewelers making the finest adornments fit for kings. The Glittering Crozier is the finest district. It boasts the highest quality shops the city has to offer. Fine dining, expensive clothing and even one of the realms biggest sweet shops can be found here. Anything one could want is surely there for sale. Gembrite’s main exports are gems. Gembrite owes its many larders and underground facilities to abandoned mining operations and dry veins. The most sought-after Gembrite export is the stone that gave the city its name, the Starlight gem. Starlight gems appear to be a kind of transparent quartz with a deep blue core. They have a special quality, however. When exposed to moonlight or starlight, they are able to refract this light in many bright colors. In the center of the city is a large round community area where festivals and events are held. Gembrite’s Castle and the Gembrite Tower are always in the background, a permanent horizon for the cityscape. Gembrite Tower is situated just off the coast and looms over the city almost a mile tall. It is a smooth stone structure with no entry point near the base, and only small windows placed sparsely around the middle and top of the tower. The tower appears to be made from regular stone or granite from a distance. On closer inspection, it is made of the same material as the Starlight gems. There is no record of its real name or any information about it. When the original settlers came here to mine ores the tower was already there. Several scholars have searched for written records of the tower with no success. Scholars agree somewhat that the architecture is out of the human boundary of creation. The tower is impossibly tall. Even more troubling is the fact that it appears to continue a few hundred feet below the sea. To this day Gembrite Tower is a mystery in the background. Most people ignore the tower altogether. It does not pose any danger or affects anyone. Nor does it offer much of a promise for a valuable reward. Lord Damasco is the current ruler of Gembrite. His authority is only superseded by a unanimous opposition from the Heraldry Council. He has ruled Gembrite for the past twenty years. His wife died years ago but left him two sons. Fargo and Damasco, both adults now. Lord Q’uarend is a cunning man. He has survived several attempts to being dethroned or outright killed. He is not the strong figure he used to be ten years ago, right after the war. He survives on instinct but what he really wants is just to rest and enjoy the royal life. His eldest son, Fargo, was groomed to rule after his father. He sits beside him most of the time to learn the trade of royalty. The slightly younger son, named after his father (Damasco), is greedy and covets his brother’s fortune. He is considered the most dangerous man in Gembrite. His house owns the main Starlight gem mine. Carlo d’Monteri is a ruthless man who will not stop at anything to achieve his goals. Carlo is sick of Lord Damasco Q’uarend. He would overthrow him and replace him if it were possible. But loyalty grows deep in nobles, he would never be accepted. Currently, he schemes with the Lord’s son, Damasco junior. The young lad’s ambition makes him easy to manipulate. Carlo would place young Damasco in power by getting rid of his father and older brother. He can then be the real puppet master of Gembrite. Sir Tabbur is a respected man in the community. His house owns a good number of mines. That’s where their riches come from. Sir Tabbur enjoys his house’s wealth, but he is more interested in other things. He expects mines to dry off in a rather short period of time so he is venturing in different affairs. Currently, he is interested in the trading of spices, silk, bee honey, and cattle. Sir Tabbur is still an able man with the sword, but he is always protected by three full armored bodyguards. Aurin Gadallar’s father was one of the original settlers. Elves enjoy such long lifespans. Since then House Gadallar placed itself very high in Gembrites nobility. Aurin, like the rest of his irk, is a very patient person. He dislikes the current state of affairs, and he dislikes his competitors in the mining business. But he has the perfect solution. He is willing to wait for all of them to die. His life will be so much longer than theirs that it appears to be the most viable option. In the meanwhile, he and his family can stand in the background and direct the show from behind. The Gaddalar family has done this for centuries unnoticed. Even when they are noticed, they only have to wait for more years. Aurin favors Fargo Damasco to succeed his father. He is also aware of the plot to kill him to ensure young Damasco inherits the throne. He means to oppose this plot. Maria was a lady-in-waiting for Lord Damasco’s late wife. After the lady’s death in a boat accident, Maria expected to be sent back home from court. To her surprise, Lord Damasco asked her to stay; finding her presence a familiar sight. She lives in Gembrite’s Castle to this day. Her role or position in court is ambiguous. What few people know is that Lord Damasco had Maria d’Avenir trained for espionage. Young, beautiful and unmarried, she is the perfect person to extract other noble’s secrets. Lord Damasco only needs to recommend a meeting and it happens. Despite the many suitors, Maria remains unmarried since Lord d’Quarend must bless the union for it to happen. Faxx Todd is an oddity in Gembrite. She is feline-folk, a tabaxi scoundrel. Faxx is not an honest person. She first found her way to Gembrite working for a band of brigands who raided caravans for treasures. She found a strange feeling of ease and comfort in the streets of Gembrite. The city is full of work for people like here. Everybody wants someone mugged, threatened or killed. Being the only feline-folk in town is not easy when working dishonestly. People suspect her, the city watch knows her. She has a secret weapon: Faxx owns a magic necklace that lets her impersonate other people. It’s just an illusion, but it is good enough.